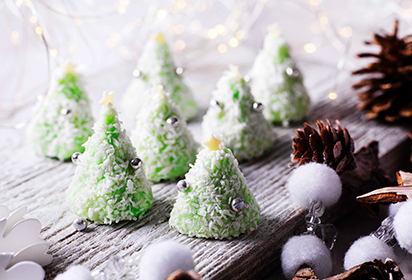 These delicious, covered in coconut Christmas trees are ideal for that cosy Christmas time. Apart from their delicious taste, these ice Christmas trees are also a beautiful addition to the centre of the dining table. Mix together the condensed milk, icing sugar and green colouring, if using. Stir in the 70g desiccated coconut. The mixture will be very stiff. Shape the coconut ice into balls then flatten the base on the kitchen surface and pinch the top, gently shaping the ball into a cone shape. Shake the desiccated coconut onto a plate and roll each tree in the coconut, making the top of the cone pointy. Then decorate by pushing the sugar decorations into the trees, you can use some white writing icing to stick them on if needed. Leave 2-3 hours until firm and set. Keep refrigerated in an airtight container and use within 3 weeks.